Villa Bee Fly II - Villa sp. 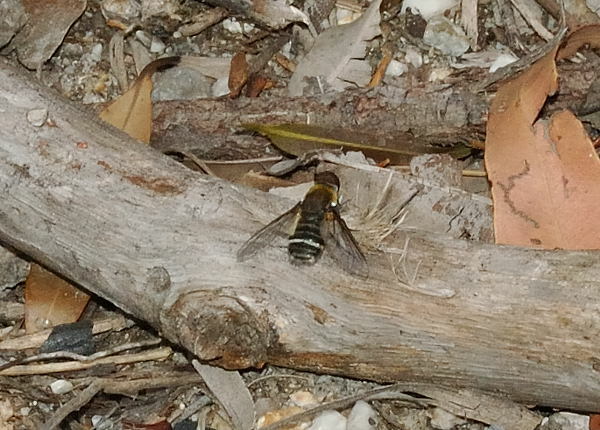 This page contains pictures and information about Villa Bee Flies that we found in the Brisbane area, Queensland, Australia. The beefly is yellowish brown in colour with banded abdomen. Those bands are dark brown with narrow pale brown, with one band is white. The wings are clear with a white spot at the wing base. 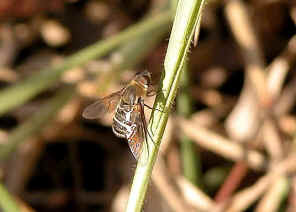 We also found the beefly in Karawatha Forest during early summer. 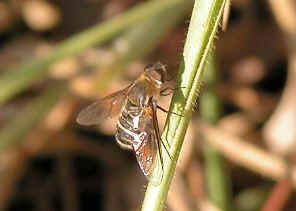 This Bee Fly looks like the above species except a bit smaller and the colours on abdomen are slightly different. The pictures were taken in Macgregor bushland in early summer. 1. Australian Wildlife Insects Flies - Lochman Transparencies, 2008, (Villa sp. ).